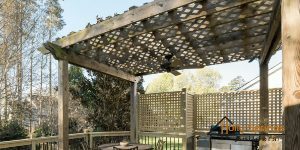 What adds to that individuality and overall contentment of your backyard deck is a pergola. Creating somewhat of an open-air ceiling, it consists of cross rafters above a patio or deck, with columns on the side for support. This beautiful structure offers several distinct advantages. 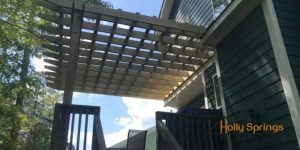 When summer’s warmth and sunshine become more intense than enjoyable, a pergola provides inviting shade, making your deck or patio even more appealing. With lovely vines trained to climb up the columns and hanging plants suspended from the ceiling, this becomes additional green space while also lending vertical beauty to your landscape. The combination of hard structure and soft plants deftly encloses your patio or deck, establishing privacy at the same time. Alternatively, curtains or latticework easily devise “walls” for privacy while retaining the pleasure of fresh air. 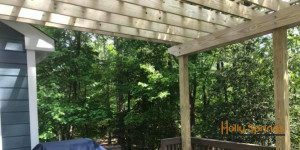 When you decide to add the charm of a custom-built pergola to your Southern Wake County landscape, allow our team of experienced professionals at Holly Springs Builders to assist you. Give us a call 919-346-0678.